I’ve had this one for years; well before my pen ‘hobby’ really got going. 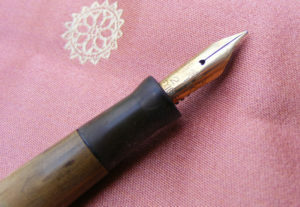 I finally restored it, and found a lovely pen with a sweet, semi-flexy fine 14K nib. GP ‘pinstripe’ body, with unobtrusive personalization. One of my first Skylines. The Skyline is a masterpiece of 1940s Art Deco styling, and this one is a fantastic writer. Smooth ‘banner’ nib, with an easy, subtle flex. Wonderful! Another Skyline, this one with the gorgeous striped pearl cap, showing shades of brown, burgundy, gold, and even a hint of green in strong light. Lovely little Wahl ringtop, but I”m not sure of the exact designation. 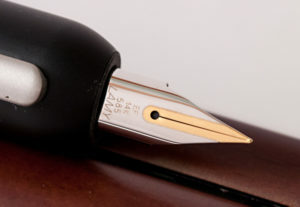 It has a super-fine nib, with a bit of flex. I don’t generally like super fines, but given the flex, if I can find its sweet spot, I think it has potential. 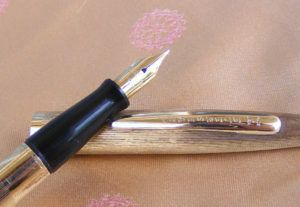 Another dainty little pen, in fantastic shape. I simply love the woodgrain ebonite pens, but this is the first I’ve seen (in person, anyway) that isn’t the ‘rosewood’ color. It’s a fantastically grained desk pen, with a restored lever filler, and a big juicy nib marked ’14K Flex.’ What more could a pen-geek want? NOS, in perfect condition, with sticker. Fantastic little pen, with a smooth piston filler, nifty little visulated ink windows, and a fairly smooth medium-ish semi-hooded nib. Also NOS, in perfect condition. A desk pen with a slightly stubbier profile than my 2 Sheaffer desk models, but with a smooth piston filler, small visulated ink windows. Has a smooth medium-ish semi-hooded nib, but with an odd oblique to it that I don’t quite have the hang of (may be a lefty problem!) 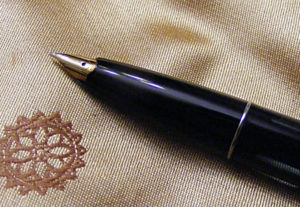 Still, a lovely desk pen, that fits perfectly in a black marble base I scored at an antique shop ages ago. 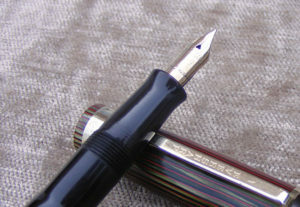 One of two Lamys that were brought back for me direct by my EX-husband from P.W. Akkerman in Amsterdam, and my first Al-Star/Safari type pen! Lightweight, but substantial, and a nice writer. 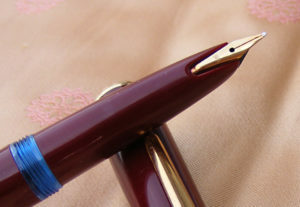 This will be a great about town pen, and I love the color! 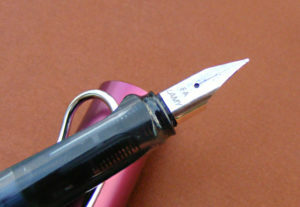 The Vista is basically the demonstrator version of the Lamy Safari. 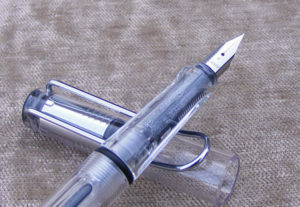 A good, solic basic pen, reliable, good writer, and the demonstrator always gets some fun comments. My first MB, and an appropriate one for that. 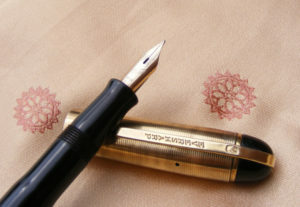 Known as the “economy” MontBlanc (as if!) this is still a very nice piece of writing equipment. Thirsty piston fill and a smooth 14K nib. 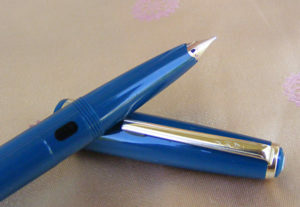 The screaming blue visulated section is a little odd, but this seems to be a solid pen that will get its share of use. 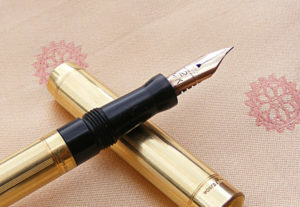 A really gorgeous pen! 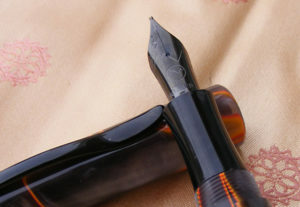 The ‘smoke and fire’ swirl with the black furnishings and nib make a really striking combination. On the lighter end weight-wise, but balances well in the hand. Like most Conklin and Monteverde pens, this one needed a bit of a nib flossing when first inked up, but works like a dream. I did have to have the section replaced by Yafa, the parent company, as the black enamel flaked off. They admitted they’d had a bad manufacturing run on this model, but the new section has put in a lot of miles with no issues. This remains one of my favorites.